Summer 2016 was when I decided to leave my job as a Research Assistant at Portsmouth University and travel to the other side of the world to try and pursue a career researching seagrass. This was a big decision as I was working on a great citizen science project in the UK and I enjoyed working at the Institute of Marine Sciences in Portsmouth – but I decided it was time to be brave! 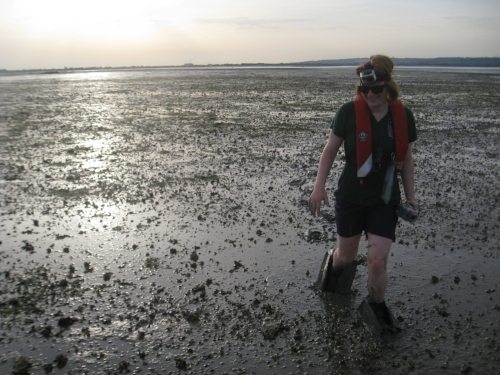 I had studied seagrass in the Solent as part of my degree and did lots of seagrass surveys when I worked with the Hampshire and Isle of Wight Wildlife Trust, but I wanted more experience researching seagrasses. Australia seemed to be the perfect place to carry out this research, especially the Queensland coast as there are large seagrass beds made up of lot of different species. I came with the hope of carrying out a PhD here but without any confirmed funding to do this. So initially I came to Gladstone in Queensland to gain experience studying different aspects of seagrass ecology, in a completely new setting. So why am I so interested in seagrass? In my opinion seagrass is a bit of an unsung hero, it doesn’t have the glamour of a coral reef or the physical presence of a rainforest but it’s working hard in the background performing so many important functions. With marine life, the phrase ‘out of sight out of mind’ is often used and I think this is especially true for seagrass – often people don’t realise they have a seagrass bed on their local beach even if they can see it when the tide goes out. What people really don’t appreciate is just how important seagrass habitats are for our coastal ecosystems and that they provide benefits not only to marine life but for humans too; seagrasses absorb carbon dioxide from the atmosphere, produce the oxygen we breathe, protect our towns from flooding as well as giving a home to the fish we like to eat. Scientists are trying to understand more about seagrasses as they are in decline worldwide, largely due to the impact of human activities. With climate change causing temperatures to rise and overfishing depleting marine stocks, we need seagrass beds and the important services they provide more than ever. I am working at Central Queensland University on a seagrass restoration project, I’ll be helping to investigate how seagrass beds can be restored in Gladstone Harbour and what the best method for transplanting seagrass cores and planting the seeds is, but there will be more blogs throughout my time here.